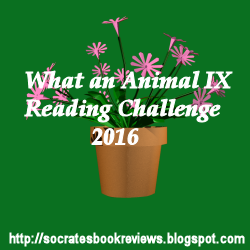 Welcome to the 2016 What an Animal Reading Challenge IX. I began hosting this challenge in 2010, when I took it over from Kristi at Passion for the Page. I love reading books that feature animals and am going to host this one again. I hope you will join me. Once you complete the challenge, if you post a wrap up post on your blog, link it below. Hi, I'm in again next year! I signed up for level 2. Looking forward to it!! This was one of my favorites this year! Thanks for hosting! I'm going for Level 4. Back for another round! I've still got plenty of animal-related books on the TBR piles. Just found this one, sounds like fun! I have plenty of books that will work! Thanks. I probably will do with level 2 7-12. Hello! I am so excited to participate again this year. I loved last years challenge! I signed up for level 3! 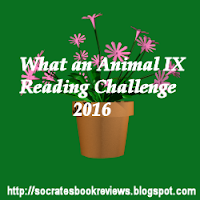 I never realized how many books I read that fit this challenge until I participated this year! Level 2 worked for me this year, so I'm going for it again in 2016. I'm finally in this year! Woot! I've been looking in the wrong places - I didn't realise so many people liked books with animal protagonists! Will you be posting a linky for reviews? I'll be joining in once again. Thanks for hosting this challenge! Commitment complete! But I'm still reading--we'll see how many more I get. Hi, I put my link for Hawkeye: My Life as a Weapon in the list of participating blogs. Really sorry. Could you move it to the right place? My review and wrap up are posted. Thanks for hosting this reading challenge. Have a great day!